Article we had published about the increasing replacement of Chlorine with Chloramine compound as a secondary disinfectant in public water supplies, the positives and potential negatives. Article we had published about the controversial topic of fluoridation in public water supplies. Many countries have ceased this practice while some continue to fluoridate. Town meetings in the U.S. have been “lively”. Article we had published about the potential health threat of high manganese levels, particularly in children. Aside from the aesthetically displeasing staining on plumbing fixtures, manganese potentially be dangerous. 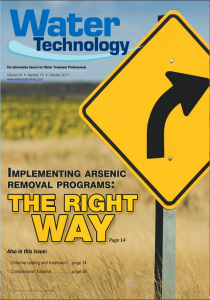 Article we had published in Water Technology Magazine when part of Atlas Watersystems about the safe and proper way to design, install and maintain an Arsenic in water removal system. Article written about us, focusing in on a project we successfully completed removing “unheard of” levels of dissolved iron in water from the water supply to a Southern New Hampshire sports & fitness center. Published in American Society of Home Inspectors Member Newsletter for the benefit of New England home inspectors that get test results back with radon in the water.